2018 proved to be our busiest year yet, with a wide range of oak framed building and structural carpentry projects across Cornwall. 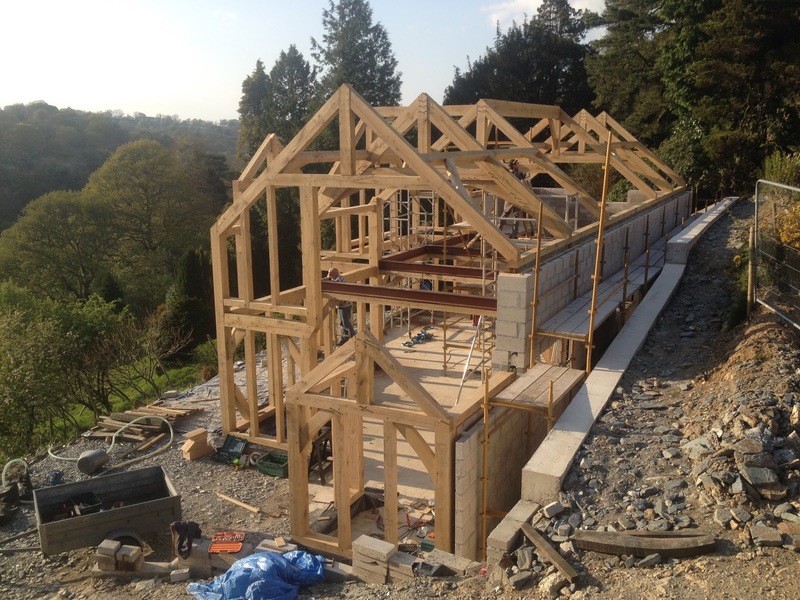 Several of the larger projects are still being completed by building contractors, and not yet ready for the camera, but below is a selection of those that are finished. 2019 looks set to continue in the same vein, but one of the first things we're building is a new website; the days of this homespun blog are numbered, and we're hoping the new look site will give a better impression of who we are and the services we can offer. Please get in touch via the contact page if you're interested in anything you see below. Happy New Year! We started cutting this nice little 2 storey extension just before Christmas, and have just spent a couple of days raising it. Phil Osbourne brought his excellent little crane up from Penwith, and after a slow start in the snow (!) on the first day, its was a pretty comfortable 2 days to raise, peg and secure. It ties into an old cottage; like most Cornish cottages headroom is an issue, so we had to make the most of the little we had, but there's enough to avoid having to duck yet still preserve the character. 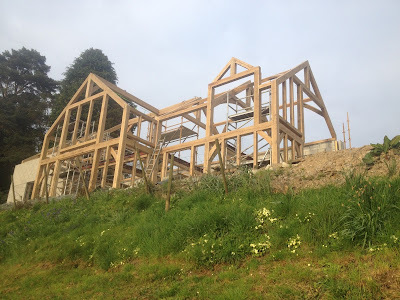 It's a fairly modern style frame...all of the front gable will be glazed, with large Bi-Fold doors opening into the garden, and more glazing through large parts of the side elevations. 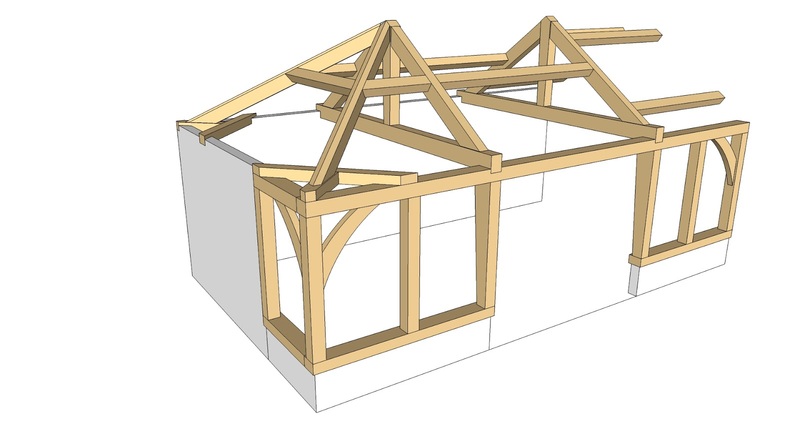 The internal partitioning will be done in softwood studwork, but there are plenty of nice features in the frame as it is; little arch braces, tapered posts and collars, and housed purlin runs...we also hope to be building an oak staircase and various other oak features into the existing cottage. All in all a great frame to start the year with. 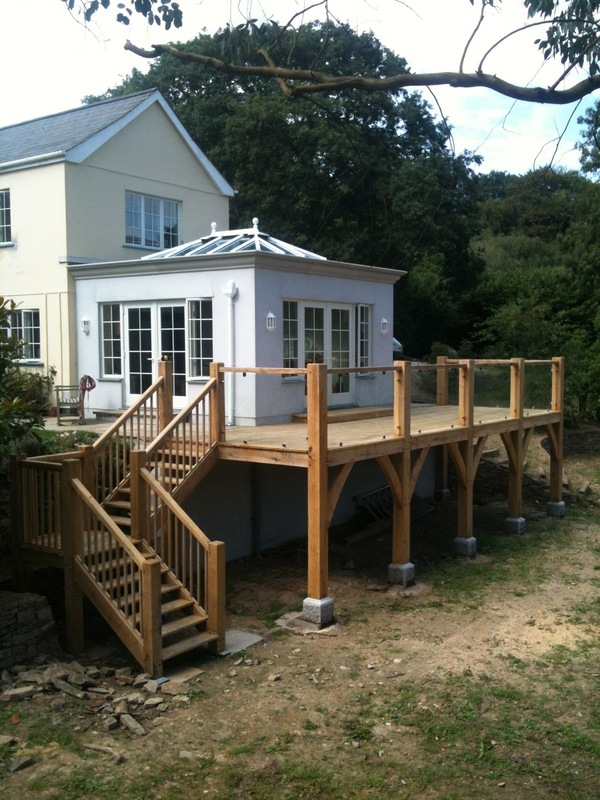 As soon as this is finished, we're back to the workshop for a sweep up and sharpen, and then straight into the next project, a small garden room with a hipped roof (see below). The workshop diary is already full right through spring and into summer with an nice variety of work...different sizes, styles and collaborators, so no time for kicking back now, got a schedule to stick to! 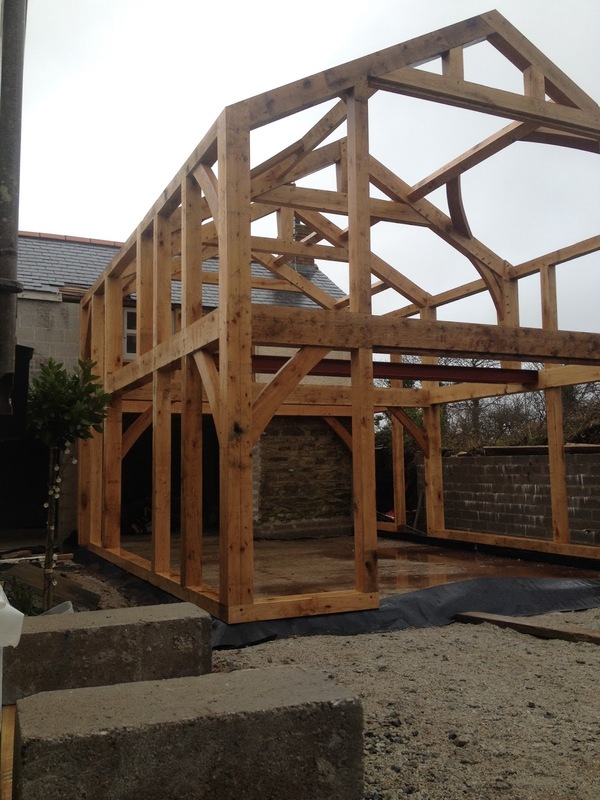 We've just finished raising this large oak framed house on the western edges of Dartmoor. It's an interesting build, something of a hybrid in the way that oak, masonry and steel are used together, but it actually makes perfect sense...using the right materials in the right area with regard to purpose, budget and aesthetic. The site is cut right into a steep slope, with a massively engineered 4m retaining wall holding the bank in place, so the rear wall of the house is a standard cavity block work wall. 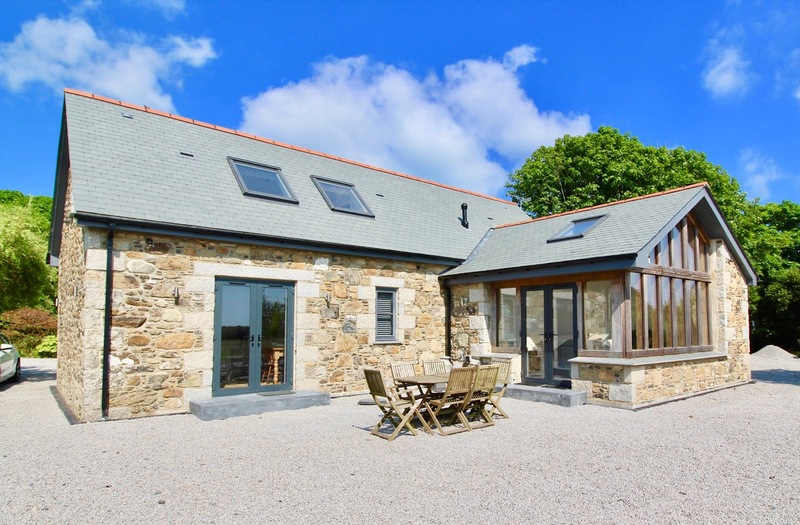 The focus of the property looks away from this, through a largely glazed western elevation, and out across fine views towards Brentor Church. Being cut into a steep slope in this way makes getting a good photograph pretty tricky; you're either way above or way below the frame, and short of having photos taken from a drone, an image from the CAD program probably gives the best overall impression of this project. 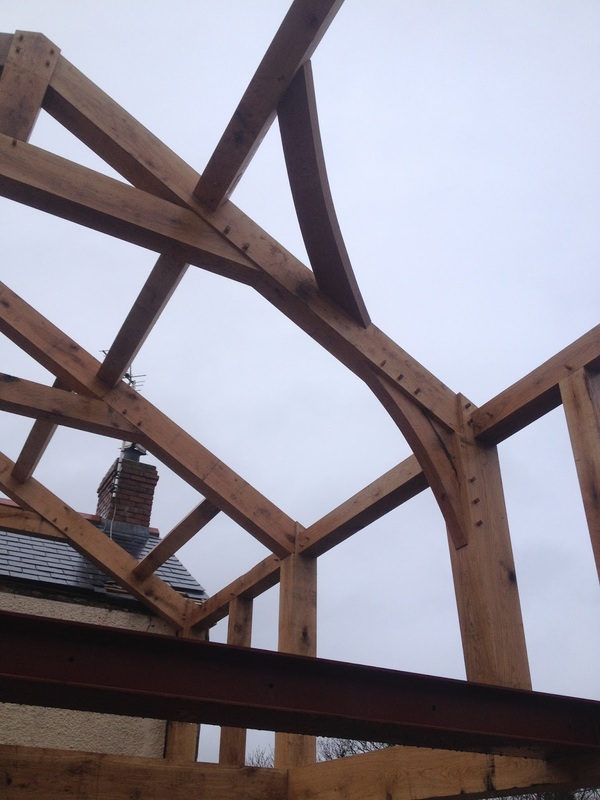 It's among the largest of the oak frames we've designed and built; although I had an architects proposal to work from, a large part of the general construction detailing came from our end. You can't effectively design and build an oak frame without careful attention to everything that interfaces with it, and I'm really pleased with how this one came out. There's a nice cyclical story to the next large project we're undertaking. 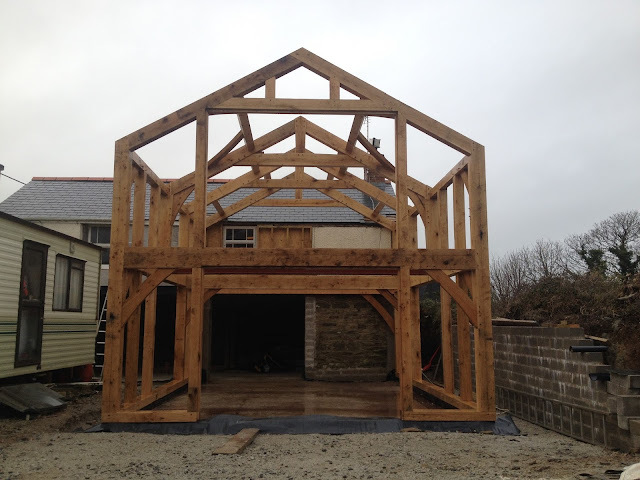 One of the first large oak framed buildings I worked on was the 4 bay barn/workshop shown below, built for Kimpton Moore near Camborne. 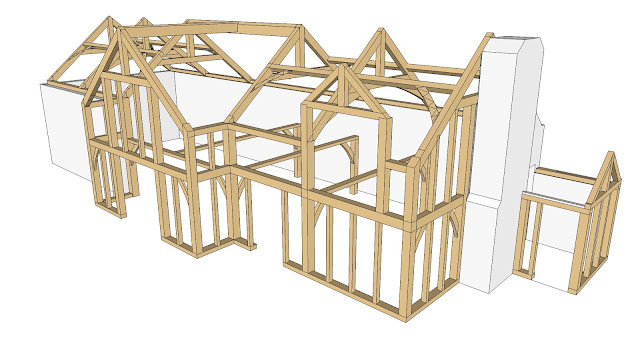 Jamie Lovekin and I cut and raised the frame in 2004, and this was probably the first project that I really started to understand the complete process of traditional oak framing rather than just following Jamie's instructions. Kimpton now runs Cornwall Hardwood Supplies and has asked us to build the frame for the house that he and his wife have been patiently planning for several years. 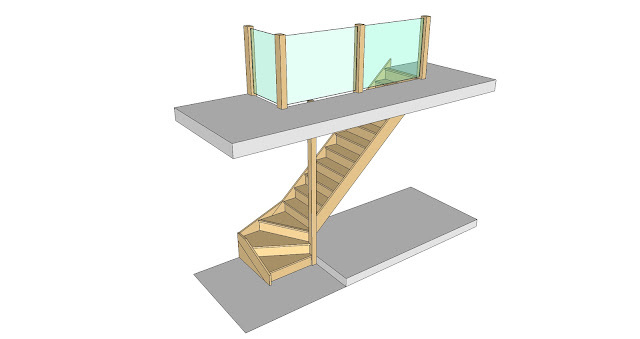 Lizard based Architect Matt Robinson has made a fine job of frame design and architectural detailing, and has constructed this 3D model to assist with the visualisation. Kim himself is milling the English oak that we'll use to build the frame. 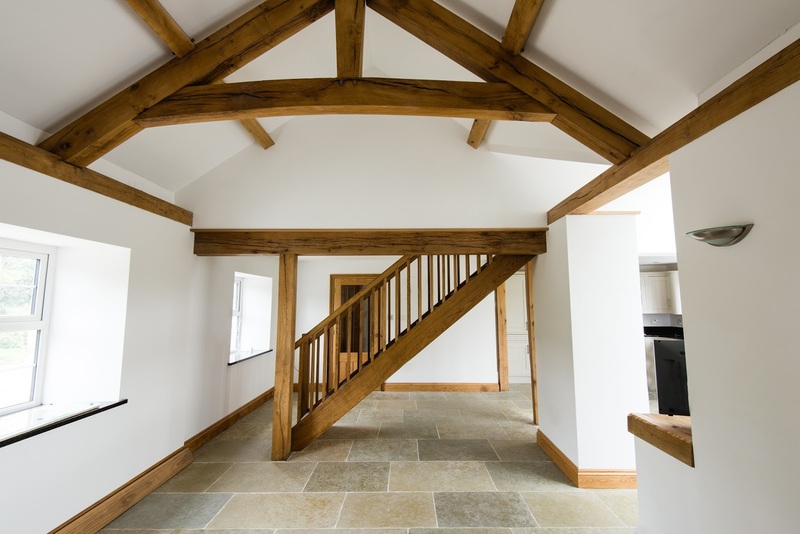 Not many of our customers are in the position to be able to mill the timber for their own house, but Kim is ideally poised with his contacts in the industry to source and saw the 23 cubic metres of green oak needed for this project. 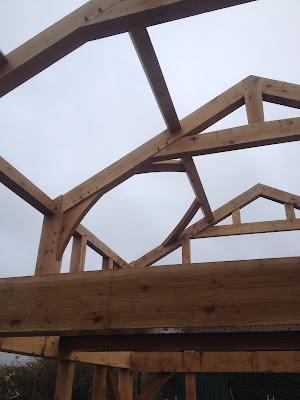 We're about a third of the way through this already, and will need to stick to the schedule...the workshop diary is fairly full right through the summer, and I'm always mindful of the knock-on effects of falling behind with a project. Aiming for a raising in the second half of June, photos to follow once it's up! 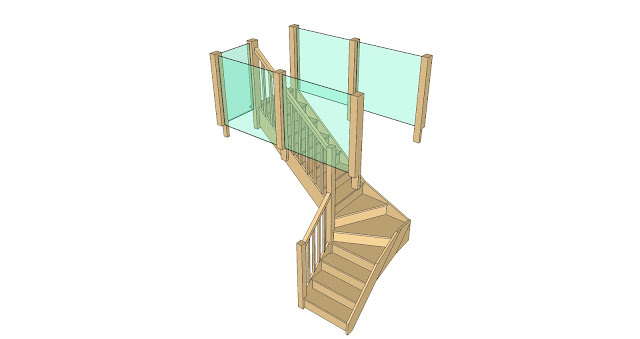 These 2 oak staircases are now installed and completed, but the site isn't yet ready to take worthwhile photos, so 3D images from the CAD program will do for now. 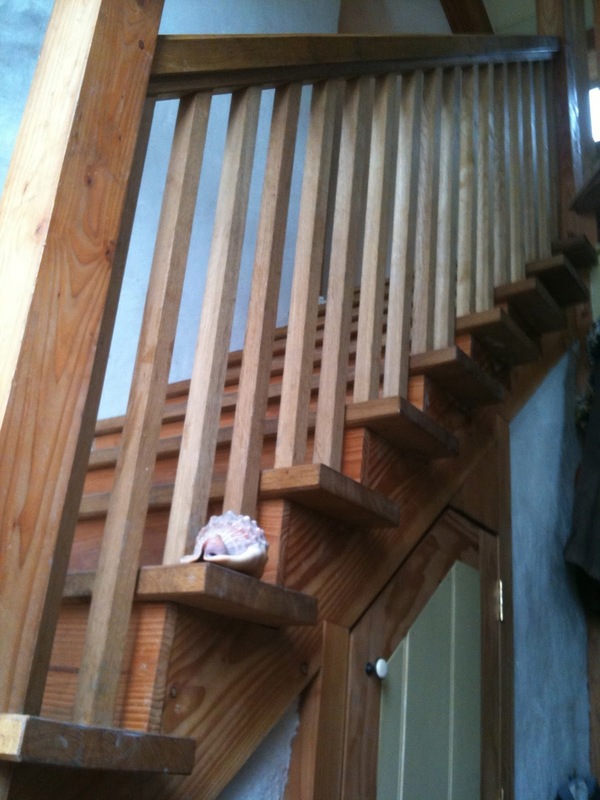 We're sometimes asked to make a set of stairs to complement heavy oak framing work elsewhere in the building, as was the case here. It's nice to have a break from working with huge oak beams and do a little lighter joinery, and the satisfaction of assembly and installation still gives the same buzz. We still use pegged mortice and tenon joinery in the newel posts, and hand cut all housings and pockets. The finished aesthetic here was modernised by using glass balustrades around the landings; we designed a housed fixing system that meant we could avoid using unsightly glazing clamps to secure the glass. Looking forward to having photos of these to put up...I've added some other photos of staircases we've made below. Generally I prefer to finish them with a light protective oil, though the external sets are really best left to silver and weather naturally...even the best oils break down under the onslaught of UV and will start to look tired and neglected after a couple of years. 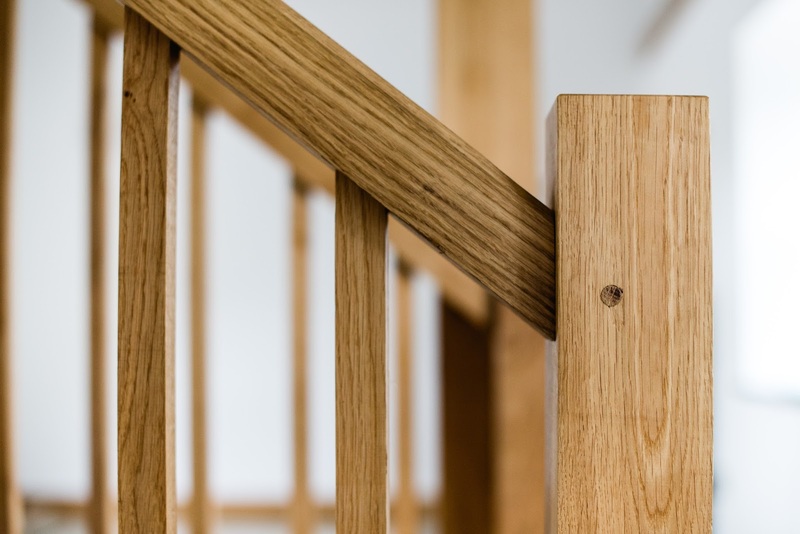 Oak's natural durability means it doesn't need any protection outside; I only use oils and finishes internally where the UV isn't an issue, and fingerprints and household wear and tear can mark raw timber surfaces.